1 - What does the Claddagh Symbol stand for? The Claddagh is made up of three symbols - The Heart stands for Love, the Crown represents Loyalty and the Hands are for Friendship. 2 - How is the Claddagh Ring meant to be worn? The Claddagh was traditionally worn on the right hand ring finger with the heart facing out to represent that your heart was available. Once you met someone it was then turned in towards your heart to show that your heart was now taken. Once married, the Claddagh ring was then transferred to the left hand with the heart still turned inwards as a sign of the commitment and love between the two people. Click on the link How to Wear the Claddagh to see our video showing the different ways it is worn. 3 - Are all the items on your website Hallmarked? Yes, all the items on our website are hallmarked. 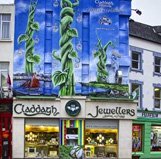 For almost 400 years Irish law has mandated that all jewellery made from gold, silver or platinum must have a Hallmark to guarantee purity. More details about this can be found in our Expert Advise section at the top of the Home page. 4 - What are the Hallmarks for the different karats of metal used? If the item purchased is made of 9kt gold it will have the numbers .375, for 10kt gold the number would be .417, for 14kt gold .585 and for 18kt gold .750. Platinum would be marked .950 and Sterling Silver .925. 5 – Are the Diamonds used in your jewellery Conflict Free? Claddagh Jewellers has a zero-tolerance policy toward conflict diamonds. Through measures such as the Kimberley Process, which tracks diamonds from mine to market, the industry in partnership with the United Nations, governments, and non-governmental organizations, polices diamond exports to prevent the trade of illegal diamonds. At Claddagh Jewellers, we only purchase diamonds through the largest and most respected suppliers who, like us, proudly adhere to and enforce the standards established by the Kimberley Process. All Claddagh Jewellers diamonds are warranted to be conflict free. If one of our suppliers was ever found to be in violation of that process, we would immediately sever that relationship. We will continue to support and promote any process that works to uphold legitimacy in the diamond trade. 6 – What are the 4 C's to look for when purchasing a Diamond? The 4 C's stand for Colour, Cut, Clarity and Carat and full details on these as well as other important details on what to look for when purchasing a Diamond or any of our other precious stones can be found in the Expert Advice Section. You could add in a 5th C for Care as your Diamond also deserves to be well cared for including regular cleaning, rhodium plating if it is White Gold and inspection of the claws etc to insure you enjoy it for many years to come. Expert Advise section at the top of the Home page. 7 - How long does it take for an item to be shipped once I place my order? We endeavour to ship all items on our website within the time frames shown with each individual product. Once the billing details supplied with your order are verified to be a match with those on file with your Credit Card Issuing company, your card will then be charged for the amount owing. We will then proceed with your order. Many items are made for you here in our own workshop, while others will be ordered for you from our suppliers. Time-frames differ for each item but each product will show you how many working days it will take to complete your order and get it ready for shipping. If the item is completed sooner than these time-frames it will then be shipped at that point.. In the event there will be any unforeseen delays due to an item being currently out of stock etc. we will notify you in writing upon receipt of your order and give you an estimate of the new time-frame. You will always be kept up to date via email regarding your order. 8 – If I want to see updates on my order how can I do this? When you place your order with us for the first time be sure to Create an Account. To do this, when you go to the Checkout page under the Billing Name & Address section, simply tick the box where it asks you to create an account to receive updates. You will be asked to put in a password, so save this password for when you wish to log in at a later point to check back on the status of your order. 9 - What methods of shipping do you offer? We offer two methods of shipping. The first is FEDEX Priority which would be the quickest of the two methods. The second is FEDEX Economy which will take a little longer. Prices vary from country to country but these prices will be shown when you go to the basket to complete your order so you can then choose which you wish to use. For shipments in Ireland and Northern Ireland we can only offer Registered Post as FEDEX does not deliver between Irish addresses. WE CANNOT SHIP to P.O. BOX NUMBERS. All orders require the Direct Signature of the person to whom it is addressed as this insures your parcel will not be left with any third party in your absence. In the event you are not there to sign for it, a notification will be left by the courier with the details of your shipment. You will be able to then bring this to your local FEDEX Parcel Depot where you can sign for and collect your parcel in person. For items delivered in Ireland and N. Ireland if you are not there to sign for the parcel then a notice is also left and you bring this with you to collect it at the postal collection centre listed on that notice. 10 - What countries do you ship to? A list of all the countries we currently ship to are shown in the drop down menu when you are filling in your billing and shipping information. 11 - Is VAT (Value Added Tax) included in the prices shown or added later? VAT is shown on all prices. If you live outside of the EU and your purchase is also being shipped to a country outside of the EU then you will be able to avail of the VAT Free prices which is automatically deducted based on your location. You will only be charged the VAT Free price of the item/s plus your shipping costs. If you live within the EU or are having the purchase shipped to a country within the EU you will then be charged the 23% VAT. Once you proceed to the payment stage of your order and fill in your Billing & Shipping Name and Address it will register the EU address given and add the VAT to your order plus the shipping options you choose. You will be able to see the full amount you will be charged before you complete your order. 12 - Will I be liable for Customs and Excise Duty Charges once I receive my parcel? If you live outside of the EU items shipped to you from overseas will incur Customs and Excise Duty fees at the rates charged in your country. These rates vary from country to country so we advise you to call your local Customs offices and find out what additional fees you may be liable for. 13 - What Credit Cards do you accept for payment? We accept Visa, MasterCard or American Express Credit Cards only. We also offer the option of paying by Wire Transfer and the details of this are included on the payment page. Please use your Order Number and Name as a reference on the Transfer. 14 - If I do not have a Credit Card is there any other payment method I can choose? We also offer the option of paying by Wire Transfer and the details needed to do this are included in the payment section of your order page. Be sure to use your Order Number and Name as a reference on the Transfer. 15 - What is your Returns Policy? We offer a 30 Day Return Policy on all regular stock items - Special Orders and Engraved items cannot be returned. Full details are in our Returns section, including information on how to return an item to us. 16 - Returns Policy for items purchased during the Christmas Season? Items purchased during the months of November and December as Christmas gifts can be returned up to the 15th of the following January. 17 - What is your Guarantee timeframe on items purchased through your website? We offer a 30 Day Guarantee on all items purchased through our website. Should the item be found to be defective due to a manufacturing fault, we will happily offer you either a full refund or offer to replace it with the same item or a different item of equal value. 18 - What if the parcel/items arrive in a damaged condition? If your order arrives in a damaged condition please hold on to all the FEDEX packaging, the inside envelope, box etc. and email us immediately. We will let you know what needs to be done to return the damaged item and packaging to us so we can get this sorted for you as quickly as possible. 19 - Will the item purchased include a gift box? All items purchased through our website come in a lovely presentation box. 20 - Can I request the item be gift wrapped? Yes, you can request that the item be gift wrapped for you. Just ask us in the comments box with your order. 21 - Can an item be engraved? We offer free engraving on any of our rings where there is room on the inside of the band. There is a maximum of 10 letters/spaces that will fit on most bands. If it is slightly more than this, then please email us first and depending on the size of the ring you have chosen and where the Hallmark has been placed there may be room for a longer engraving. Items that have been engraved cannot be returned. 22 - Can Special Orders be returned? Unfortunately Special Orders or Engraved items cannot be returned. 23 - If I see an item in your shop but cannot find it on the website is it still possible to order it? Yes, if you see an item in one of our shops in Galway or Dublin and can't make the purchase at that time, just ask the sales staff for the product ID code and description of the item. You can then email us at info@thecladdagh.com when you are ready to make the purchase with these details and we can arrange to get the necessary information to complete this purchase for you. 24 - Is your website a secure one? The presence of SSL means you can rest assured that communications (e.g. credit card numbers) between your browser and this site web server is private and secure when the SSL session is activated. 25 - Can your items be purchased through other websites such as Amazon or Ebay as I have seen similar items on them? No we are not affiliated with any of these websites nor do we sell our products through them. All our items can be purchased through our own website www.thecladdagh.com or in our shops in Galway & Dublin. 26 -What are the Birthstones for each month? Please note that great care must be taken when wearing sterling silver jewellery items with gold plating. Gold plating will wear away over time. Do not clean or shower while wearing items of jewellery with a plating over the sterling silver. Harsh chemicals will remove the plating quickly and will cause your silver to tarnish. Do not clean the items with anything harsh. Keep away from soaps and other detergents as well as cleaning products. Do not leave your sterling silver jewellery in the sunlight as it will tarnish quickly. Always take off all your jewellery before retiring for the night. Be careful when spraying and wearing perfumes as they can cause the items to tarnish quickly and can remove the gold plating on items. Do not swim with the items in chlorinated pools or the sea. Have the items professionally polished if they become tarnished. Plating on jewellery is not covered after the 30 Day Guarantee period has passed. When choosing a ring or a band from our website you will need to have your fingers measured accurately by your local jeweller. They will have you try on rings/bands that are the same width as the one you are looking to purchase - these measurements will be found with each product description on our website. It is very important that the rings/bands you are sized with are the exact same width as the one you are looking to purchase because if you are looking at any of our wider styles then your ring size will go up anywhere from a half to a full size or more that you would choose if you were purchasing a narrow ring/band. Thinner ones will sit in the indent at the base of your finger and are easier to get on and off, whereas with a wider band it sits further up your finger where it widens out and if not measured correctly the ring will not fit comfortably and may pinch or cause your finger to swell. Bring these meaurements with you to your local jeweller so they can work out the correct size for you based on which one feels the most comfortable. Rings/bands with a continuous pattern the full way around, such as Wedding bands and Celtic rings, can only be made as a " Special Orders". These rings cannot be resized as the pattern would no longer match up. They also cannot be returned once completed as they are each individually made to-order for you based on the sizes given with your order. Each ring will show the individual Irish Letter sizes that are available for that particular ring in the drop down chart accompanying it if you are placing your order from an address within the EU. If you live outside of the EU then the drop down ring size chart will show your correct size but in the Canadian/American Number sizing format so you can choose from the numbers sizes shown for that ring. Your local jeweller should be able to do the conversiuon for you to one of these two formats once they have measured your finger. 29 - What are your office hours should I need to speak with someone? Our office and workshop are open Mondays to Fridays, excluding Irish Bank Holidays, from 9.30am to 5.00pm GMT. Outside of office hours please email us with your questions and leave a contact number you can be reached at during our opening hours and we will get back to help with any queries you may have.